I’m a writing book junkie. Sometimes, I'm one of those people who loves to read about writing more than I actually love to write. 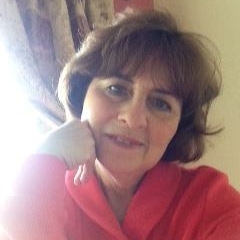 There is a mystique surrounding a writer’s life, especially for those of us who are wannabe’s, who worship at the throne of “real” writers - you know, the ones with actual books that have been printed with paper and ink. 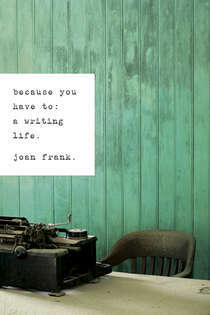 So when TLC Tours offered me the opportunity to read/review Because You Have To: A Writing Life, by Joan Frank, I readily agreed to feed my reading-about-writing habit. Frank contends that those who are called to write must do so, no matter what the privation. She uses herself as a prime example, discussing the ways she has supported her writing (a published body of work that include two short story collections and three novels) with mostly low-paying office jobs. She talks about co-workers who complain that she is unresponsive when she drifts into a daydream about her latest work. She relates tales of ekeing out moments to write between fielding phone calls and typing letters. “There is never enough,” she titles one of her chapters. Never enough time, money, silence, appreciation. She talks about the isolation that writers sometimes feel, the need to “build a kind of coherent wholesome scaffolding around the essentially lonely, aberrant, and certainly unjustifiable act of writing.” She advises the writer to “be careful whom you tell,” about your writing, because “Americans tend to feel uneasy when confronted with someone professing to practice art.” She shares some “gruesome stories” about marketing and rejection. She does not sugar coat the writer’s life, oh no she does not. But still, this reader can sense on every page how compelled she is to put words to paper, to express ideas, to work out emotions and scenarios and possibilities on the printed page. Frank looks at the writers life -well, frankly - but in a way that makes you still want to be part of that mysterious brotherhood. She even writes about those writing books I love to love so much. You can collect dozens of technique books. In the end, writing that has life in it can’t issue from someone else’s formula, like dance steps painted on a plastic mat. Anyone with an instinct for the shape and sound and movement of language must somewhere in her heart recognize this lonely truth, and agree to trust herself to go forward, absorbing the advice that fits along the way, tossing the rest. Because You Have To: A Writing Life. Joan Frank tells it like it is in this very personal, sometimes funny, sometimes acerbic, sometimes joyous book about what keeps her coming back to the page. We write to investigate, attend, witness. When even the biggest literary names make victorious reading tours, they often admit how unhappy they feel until they have settled into the next writing project - how hungrily they miss working on something, amid whatever aclaim. I believe them. The itch, the yearning, the glimpse of the next tantalizing, disturbing idea - how can I broach it, solve the inescapable problems? Where might I take it; more accurately, more excitingly, where might it take me? The call of the dream: getting back to it, getting it down. Product is good, but process, we learn the hard way, it the real tugging star. One following onto the next, a whole sparkling cosmos of them.